With a significant percent of Fortune 500 size organization’s running on mainframe systems, their value and importance are critical to the continued success of the enterprise. Yet, running these applications in the most efficient manner possible to speed execution time and minimize resource usage continues to be challenging if the proper steps are not taken. A key area of focus is always determining and setting the best buffering environment for an application when accessing VSAM and non-VSAM data. from creating new or performing maintenance to applications. Application developers’ time is already stretched quite thin, and their priorities are almost never focused on optimizing application performance over the long term. dynamically defining the optimal buffering environment each time an application opens a data set. For VSAM data sets, this means VELOCI-Raptor is not locked into a predefined selection. It will choose either Non- Shared Resources (NSR) or Local Shared Resources (LSR) buffering, without any manpower required. 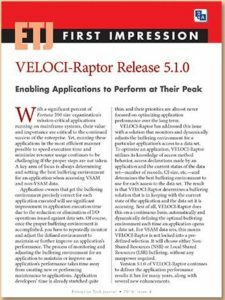 Version 5.1.0 of VELOCI-Raptor continues to deliver the application performance results it has for many years, along with several new enhancements. Three new QSAM enhancements are provided in Version 5.1.0 of VELOCI-Raptor. Additional support for address spaces experiencing “region stress” issues is provided. Support for the use of R31 buffers where possible has also been added. Additional support for buffer pool storage monitoring and reclamation completes the enhancements for QSAM. Two new enhancements have been added for VSAM support. First, enhanced support of the use of LSR in a batch environment is included. This permits VELOCI-Raptor to dynamically determine the originator of LSR requests—whether made by the application or by IBM’s Batch-LSR (BLSR) component—and customizes the optimization based on who originated the request. Second, the interface has been re-structured and is now faster—especially when gathering statistics. VELOCI-Raptor 5.1.0 now operates using a smaller footprint. The R24 “below-the-line” footprint for the VELOCI-Raptor VSAM interface has now been reduced to less than 512 bytes. The VELOCI-Raptor rule sets have also been condensed, resulting in fewer CPU resources being used when searching for the optimal rule. User customization of VELOCI-Raptor has been simplified so that Dynamic Control Facility (DCF) can now be used for all product customization. DCF can now be used to dynamically override all VELOCI-Raptor global settings, to select specific optimization rules (such as forcing the use of either LSR or NSR) and to dynamically apply overrides to selected optimization rules. environment, thus permitting an organization’s current solution to remain active. When an organization is converting to VELOCI-Raptor, the Conversion-Assist feature eliminates the need to manually migrate optimizations from one product to another, along with the need to stop one product in order to use the other. In addition, the Conversion-Assist feature can permit the reproduction of the previous performance optimization tool’s environment into VELOCI-Raptor when an organization provides some basic configuration details. The Conversion-Assist feature allows the running of VELOCI-Raptor 5.1.0 alongside a previous release of VELOCI-Raptor when upgrading, enhancing and simplifying the entire process.